After describing The Apprentice as a “loathsome show” and stating that the business community doesn’t like Lord Sugar, I thought you might like a response to the article by Luke Johnson in The Daily Mail. This is response from someone who has worked for some of the finest businesses in the world and has also taken part as a candidate on the show. Me. It’s six years since it was screened and nearly seven since it was filmed. People still ask me what it was like to take part in The Apprentice. I’m not surprised. The show has become a national annual TV event and more people than ever watch the series. I absolutely loved it. It was a surreal experience and one I will never forget. Of course I would have liked to have won. With hindsight there are things I could have done differently. But I entered to win but accept I was not what the then Sir Alan was looking for. I am still in touch with many of those candidates from that series and with Lord Sugar, Nick and Margaret. Margaret decided after five series to step down to focus on her PhD. The formidable Karren Brady has replaced her. Despite the fact that Lord Sugar spent a page and a half insisting in his rather entertaining autobiography that I only took part to become famous, he was wrong. What he forgets is that no one knew what that first series would be like, how it would do in the ratings and what our lives would be like after the series aired. I certainly don’t mind that his recollection of events is different from mine. I have never sought to be a “celebrity” and nor do I wish to be. I am however keen to be well known for what I do. That’s very different. For the past five years I have worked hard, mainly on radio. It’s not an industry you can just walk into and expect to be competent. It’s hard graft. Graft I really enjoy. To be a presenter on LBC Radio is a real privilege. Yet I didn’t enter The Apprentice to do what I do now. It just sort of happened. Having completed the filming, we could not simply go and get a new job. The contractual situation was a mess. Business doesn’t really like television and those who have appeared on it. Well, not unless yr the boss anyway! Similarly having been a partner of a private equity firm I had a year “non compete” in my contract and was certainly not going to be able to go back. So I had to look for new opportunities. That’s what I did and continue to do. For anyone who thinks you take part in a show like this and have offers thrown at you, think again. Having said that, doors do open and it’s simply down to you to pursue avenues as they appear. In my case I was offered a position at an investment bank. Except is was a delayed offer. Delayed by a year as the chap in charge said he’d heard me on the radio and thought I should give that a shot. The rest, as they say, is history. Public perception is very different from reality. The perception is that you take part in a show like this and you are set up for life. The reality is that for those who do take part, you have to work hard after the cameras stop rolling to carve a new career. I am certainly not complaining and I have been able to do many and exciting things as a result of having taken part in the show. More importantly I have met some amazing people along the way. So, when I read Luke Johnson’s preview to this latest series in The Daily Mail, I was cross. Luke Johnson is the former Chairman of Channel 4 and indeed has a considerable and impressive track record in business. He’s a business success and has plenty of useful contributions to make. I don’t know whether he got of his bed the wrong side the morning he wrote his article but he’s wrong on so many different levels. He described The Apprentice as a “loathsome show” and then went on to say that the biggest laugh at an event he spoke at was an entrepreneur who had created a loo roll with Lord Sugar on every sheet. Hilarious. What an entertaining day that must have been. Yet here is a man who was chairman of Channel 4. The station that bid against the BBC to win the Apprentice as a format from its makers, TalkBack Thames. Who was chairman at the time? Perhaps this is the real reason Mr Johnson has attacked the show and the format. 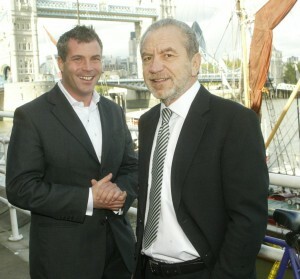 Or is it that Lord Sugar is a Lord and he isn’t? Mr Johnson explains how, when he was at Channel 4, they came up with such formats as Jamie’s School Dinners. Great telly. But does television like that actually do anything useful at all? Or is it simply a publicity stunt for Mr Oliver and the politicians who signed up to various empty promises? Do our children eat any better than they did before? No. Have school dinners improved? Unlikely. Yet when I go to schools and universities, The Apprentice has had a real impact. Youngsters are interested in business. Interested in setting up on their own. Developing new ideas and realising that you can start up if you have an idea and are prepared to work hard. I am not saying that The Apprentice is a format that teaches everything you need to know to be a success. I recognise and so do most of the British public that this is entertainment television with a business thread. One could argue that everything the candidates do is exactly what you should not do to succeed in real life! But that is to miss the point. Each week there are real business lessons. There are elements that you can learn from and most importantly the show has inspired young people to think about business for the first time since Margaret Thatcher was Prime Minister. We all know that real bosses don’t say “You’re Fired!”. We also know that people cannot and should not behave as they do on the programme. But this is television. The BBC is in the business of making television. They are in the business of securing ratings. That’s exactly what they have done. Year on year building the brand, developing the show and this year substantially reinventing the format to ensure it is relevant to today’s difficult economic circumstances. For Mr Johnson to argue that the world of business is collegiate and wonderful is again a step away from reality. Perhaps he should look at the media industry. The way people are hired and fired. The treatment of freelancers is often lamentable. Sexism, bullying, overwork and under pay is rampant. Indeed the businesses that he has backed have made a considerable fortune. But who other than senior management and financial backers have done well from the successes of Pizza Express or Strada? I don’t think you will find many of the chefs, waiters and day-to-day staff having profited significantly or retiring with a high standard of living. As if that wasn’t enough, Mr Johnson then decides to take a pop at the property industry. The industry in which I originally trained. Three years at university and two years professional training after that. Apparently the property industry “generates few jobs and no exports”. What utter claptrap. Try telling that to the construction workers, property investors, professionals, architects, fit-out specialists and investment banks to name but a few. What about our pensions that rely upon the property industry for income and capital growth? Every business needs an office, or shop, warehouse or distribution park. Without the property industry other businesses simply would not exist. Lord Sugar had a very successful electronics business and after monetising it, he decided to diversify. Indeed he still has a range of business activities ranging from electronics to aviation. Property has served him very well and I’d argue that the property industry is one of the nation’s finest investments and exports. If the message from Mr Johnson is that we need to have better education in schools. Or that television needs to play its part in encouraging entrepreneurialism or even that we need to reform the House of Lords so that it’s less of a political fraternity and a real democratic part of our political system. Then I agree. Indeed if he wants to reduce bullying in the workplace, sexism in the boardroom, improve pay and conditions for workers and tackle the horrendous problem of exploitation of freelancers… then again, all very admirable. He has invested in and developed from scratch some very well known businesses. There is no doubt that he has a real talent. Yet he is the sort of person that needs to do more. Instead of sniping and sneering from the sidelines. It’s clear from his article that in fact he doesn’t like Lord Sugar. He is jealous of the programme’s success and has totally missed what the show is about, why it works and how it has become so popular. I am not here to defend Lord Sugar or the programme. However my advice for Mr Johnson is simple. Before you state that successful businessmen and women are not flash egotists, perhaps need to look at yourself before criticising others. See here for the evidence! http://www.lukejohnson.org And as a TV reviewer and ambassador for business, Luke Johnson? You’re Fired! you both seem to have got up on the wrong side of bed!!! and both have vaild points!